With its ultra-low 6dBA self-noise and transformerless circuitry, the RODE NT1000 exhibits exceptional performance when recording both vocals and instruments. 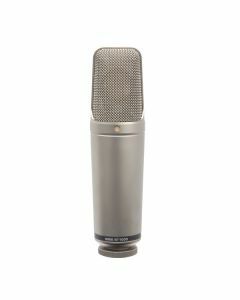 Voiced for versatility, it has been hailed by many as the ultimate microphone for grand piano and drum overheads. The NT1000 is also a fantastic vocal microphone. The RODE NT1000 microphone is designed and made in Australia, and covered by RODE's industry leading 10 year warranty. With its ultra-low 6dBA self-noise and transformerless circuitry, the RODE NT1000 exhibits exceptional performance when recording both vocals and instruments. The RODE NT1000 microphone is designed and made in Australia, and covered by RODE's industry leading 10 year warranty.